Ultimately, it was a battle between ultra ripped defending champ RONNY ROCKEL and the great DEXTER JACKSON, with The Blade prevailing. Legendary VINCE TAYLOR came in third and enormous Joel Stubbs and Swede Martin Kjellstrom showed immense potential for the future. Japan’s first ever Olympia qualifier, Hide Yamagishi was a popular hit with the very vocal crowd, taking 5th place. 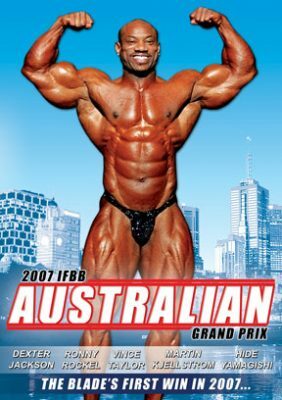 He was also the first ever Japanese competitor at a pro show in Australia. This video includes the complete Pro prejudging and Finals, Cormier and Sarcev interviews, plus photo gallery.